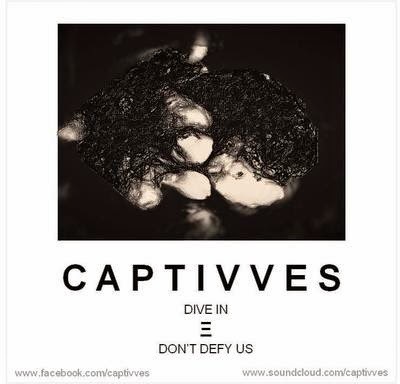 Captivves are a three piece band from Reading and this is their debut double A single Dive In and Don’t Defy Us. I was once held captive in a school when I was younger, but it turns out the electricity failed and simply trapped the doors. It was a slightly terrifying moment of my childhood, but one that made me into the person I am. Terrified of power cuts. Dive In introduces us to the paddling pool of Captivves by immediately hitting us with various instruments like the noodles and slides and the little ring things that sometimes put you on the verge of death than elation, but this kind of paddling pool gives us drums, bass, guitars and a tempo that injects heroin every now and then to keep things on the right and wrong sides of energetic to create something that is exciting, head-bangingly addictive and a rather good rendition of some modern post-punk. All of the above appears on Don’t Defy Us though Captivves add in a bassline to keep things firmly tucked inside the world of Bauhaus and everything else that leaves your hands stained with dust. The trio allow this track to explode with all kinds of big booming sounds from all instruments to close out what has been a pretty good and very interesting introduction. Nice one guys. Stream both tracks below, and for more music reviews, free downloads and if you jump in this paddling pool we’d both be wet check out Exploding Head Syndrome on Facebook and Twitter.